This article covers the possible causes and solutions if Macrium Reflect freezes during startup. 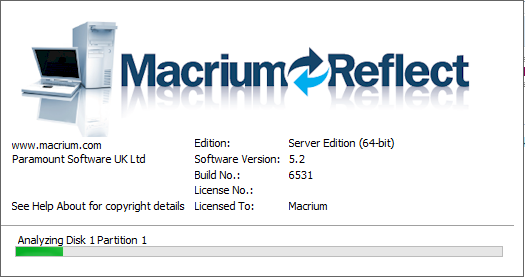 When Macrium Reflect starts the first task is to read all locally attached disks and load information about disks, partitions and file systems. This is a low level operation and requires Windows highest privileges. Corruption is preventing File System meta data from being loaded. To establish if this is the case, boot into Windows Safe mode or into Windows PE to see whether Macrium Reflect can be started from either of these environments. If you receive the same problem then it's very likely that a local file system has a corruption problem. To start Windows in Safe Mode please see the following Microsoft articles: Windows XP, Windows Vista, Windows 7, Windows 8. To start your system using Windows PE, create your Macrium Reflect Windows PE rescue media and start your system using DVD, USB or Boot menu. 1. Start a command prompt with elevated privileges. For more information on how to do this click here. 3. Enter 'Y' if you receive the 'schedule this volume..' message. and reboot your PC. 4. Repeat for all other local drives on your system. 1. Perform a Windows 'Clean Boot' so that Windows is started with a minimal set of required drivers and startup programs. More information on how start Windows in 'Clean' mode can be found in this Microsoft KB article. 2. Temporarily disable your Anti-Virus software and/or add Macrium Reflect to your Anti-Virus software 'white-list' or 'Trusted Zone'. Please check your Anti-Virus software help for instructions on how to do this.